You will encounter two different rating systems as you read about rivers and plan trips. The most common is the International Scale of River Difficulty, with its Class I-VI ratings. The other is a Class 1-10 system used on some western U.S. rivers, most commonly on the Grand Canyon stretch of the Colorado River. The 1-10 system roughly equates to Classes I-V on the International Scale, with 1-2 somewhat equivalent to Class I, 3-4 to Class II, 5-6 to Class III, 7-8 to Class IV and 9-10 to Class V.
Both of these rating systems offer an index of difficulty allowing you to determine whether you have the skills and equipment for a certain river or rapid. They are useful, as long as you recognize their limitations. Both systems are subjective, that is they are based on opinions, albeit opinions of experts. A number of factors can modify the ratings. Ratings are interpreted differently in different parts of the U.S. and the world. It’s quite common to hear comments like these from river runners – “Well, the guidebook calls this a Class IV run, but I think it’s only Class III.” Or, “In the (you name it) section of the country, they’d call this a Class V, but out here it would only qualify as a Class IV.” If you’re going boating in a new area, check with local sources. A rating given to a river or rapid is a snapshot; it's based on the informed opinion of persons who've been there, usually over multiple seasons and in many different flows. Still, it may not capture the difficulty of the river or rapid in all seasons and all flows. What may be a Class IV under normal conditions can be Class V in high spring flood. Wood, strainers and other obstacles can definitely up the difficulty level. Remoteness of location significantly affects difficulty rating. A stretch that would be Class III+ if it were along a road might well qualify for Class IV or IV+ if it’s in the backcountry, far from needed outside help. Cold water and rainy conditions up the hazard level of any water. Taking a swim or even getting and staying wet, in these conditions, exposes boaters to the danger of hypothermia Cold Water Protection & Hypothermia. The night of June 10, 1965, heavy rains brought a wall of debris down Warm Springs Creek, a tributary of the Yampa River, in Colorado. It transformed what was just a riffle to what even today is rated as a Class IV rapid. A boatman in the first rafting party that went through the rapid on the morning of June 11th drowned. The rating systems are invaluable for giving boaters a guide on what to expect when running a river system or rapid. Just remember, they are only guides. There is no hard and fast, ironclad way to determine if you are up to a certain rapid or river. Use good judgment, consult multiple sources and talk to others who’ve been there under similar conditions. 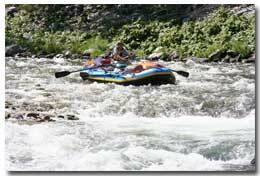 When on the water, pay attention and stay alert for unexpected hazards and scout unfamiliar rapids. 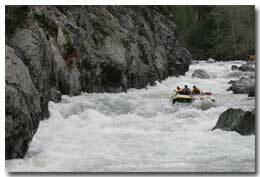 Extremely long, obstructed, or very violent rapids which expose a paddler to added risk. Drops may contain** large, unavoidable waves and holes or steep, congested chutes with complex, demanding routes. Rapids may continue for long distances between pools, demanding a high level of fitness. What eddies exist may be small, turbulent, or difficult to reach. At the high end of the scale, several of these factors may be combined. Scouting is recommended but may be difficult. Swims are dangerous, and rescue is often difficult even for experts. A very reliable eskimo roll, proper equipment, extensive experience, and practiced rescue skills are essential. Because of the large range of difficulty that exists beyond Class IV, Class 5 is an open-ended, multiple-level scale designated by class 5.0, 5.1, 5.2, etc... each of these levels is an order of magnitude more difficult than the last. Example: increasing difficulty from Class 5.0 to Class 5.1 is a similar order of magnitude as increasing from Class IV to Class 5.0.